In my last post, I introduced some of my favorite children’s works for studying Shakespeare’s The Tempest with young students. For the older elementary and high school student, the full text is the most appropriate choice, and there are numerous editions which will make this play a bit more approachable. First of all, no one should ever feel embarrassed to read a simple child’s edition as an introduction to any of the Bard’s works, and this holds tr ue for The Tempest as well. 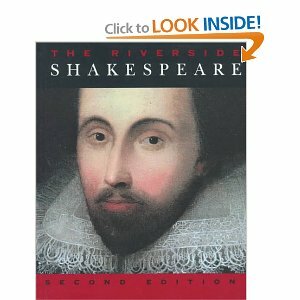 In college (as most English majors do) I purchased the Riverside Shakespeare and today, despite its very weighty and bulky mass, I love it. Mine is highlighted and marked through many of the works, and it is always a joy to return to those old notes and remember inspired lectures by beloved professors. The wide margins and onion skin feather-light paper speak of importance and an almost scripture-like quality. The annotations and definitions are very helpful as are the textual notes before and after each play. The Tempest contains a number of themes but this brief introduction will concentrate on three: reality and illusion, natural man vs. civilized man, and most importantly,vengeance vs. forgiveness. The plot involves Prospero, the former Duke of Milan, his daughter, Miranda, and a native islander named Caliban. These three are the only inhabitants of a magical island home until a fateful storm (thus The Tempest), brings upon the island Prospero’s brother Antonio, (who usurped the Dukedom), his co-conspirator Sebastian, Alonso–the King of Naples, his son Ferdinand, and a few other minor players. Set on an indeterminate island, The Tempest is Shakespeare’s play that comes closest to having an early colonial connection, as the island setting draws upon descriptions of Bermuda (Bermoothes) brought back to England after one of the early Virginia expeditions was shipwrecked on this beautiful and habitable isle. Subsequent pamphlets published describing Bermuda are the likely source of Shakespeare’s “mixing the atmosphere of a Mediterranean island with that of a New World discovery” (Riverside, 1657). Also, the colonial connection relates to Prospero and Caliban. 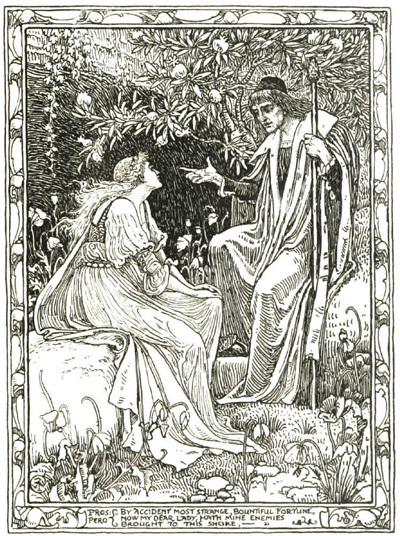 Prospero (along with his daughter, Miranda) essentially “colonizes” the island, and attempts to civilize the native Caliban by teaching him English, while Caliban opens to Prospero the secrets of the island. But the relationship sours and the surly Caliban complains to Prospero, “This island’s mine by Sycorax my mother,/ Which thou tak’st from me” (I. ii. 331-332). But Prospero defends the “kindness” and “human care” he showed Caliban until Caliban sought to “violate the honor of [his] child [Miranda]” (I. ii. 347-349). The theme of natural man represented by Caliban, and civilized man, represented by Prospero, continues throughout the play and becomes more complex as Caliban mistakes two drunken sailors for gods, and as Prospero confronts the murderous and savage behavior of his civilized brother Antonio. When King Alonso and the good Gonzalo are visited by strange-shaped creatures of Prospero’s magic, the two believe they are natives of the island and the astonished Gonzalo notes that “T hough they are of monstrous shape, yet note/ Their manners are more gentle, kind, than of/ Our human generation” and Prospero remarks aside, “Honest lord/ Thou hast said well; for some of you there present/ Are worse than devils” (III. iii. 31-35). Prospero reminds us that all of life is a grand play with its gorgeous palaces, towers, solemn temples, the great globe itself (and here of course his double-meaning–the Globe Theater, and the earth) is clear. The material world to which we are so devoted, will one day vanish into “thin air” and we will not leave a “rack” (a wisp of cloud) behind. Our life is rounded with a sleep–the sleep of night’s rest, but also the eternal rest of death. Prospero’s transcendent perspective also informs what it seems to me is the strongest theme of the play: his forgiveness of his enemies. Prospero demonstrates what is a repeating theme of Shakespeare’s works–the forgiveness of those who have deeply wronged us. Betrayed by his brother, and put out to sea and an almost certain death, nonetheless, Prospero chooses mercy. “Though with their high wrongs I am struck to th’ quick,/ Yet, with my nobler reason, ‘gainst my fury/ Do I take part. The rarer action is/ In virtue than in vengeance” (V. i. 24-28). And later to his brother he says, “And you, most wicked sir, whom to call brother/ Would even infect my mouth, I do forgive/ Thy rankest fault–all of them” (V.i. 130-132). And even the malicious Caliban who conspires to murder Prospero, receives mercy from his intended victim, which inspires him to reform his ways promising “I’ll be wise hereafter,/ And seek for grace” (V. 1. 295-296). And so, The Tempest begins with treachery and betrayal and ends, as often Shakespeare does, with grace. Enjoy this delightful play with your students!